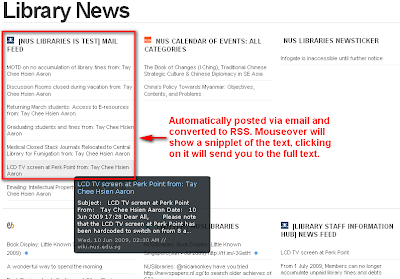 Next I cover three main types of RSS aggregators one can use including traditional RSS feed readers (e.g. Google reader), Startpages (e.g Netvibes) and lifestreaming services (e.g Friendfeed) that one can use. 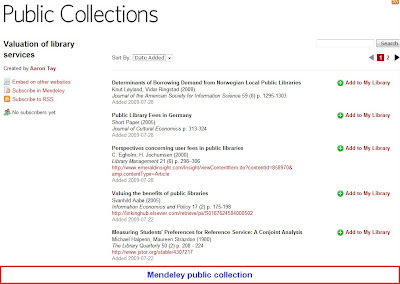 Lastly, I mention why I think using RSS aggregators this way is not ideal mainly due to the lack of bibliographic management functions, and that existing services and products like Mendeley, Zotero, 2collab should incorporate RSS aggregation features. What sources should I monitor? When I do research, I’m pretty through in the Literature review phase. I’m the one who does the broadest possible search in Google scholar and then ploughs through over 300 results looking for anything relevent. But thoroughness in terms of going through results is pointless if you look at the wrong places. 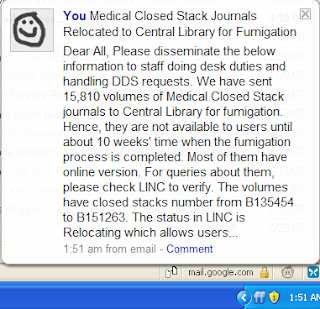 In the “old days” it was “easy”, you basically setup alerts for your favourite journals/databases and you were done. Today this isn’t sufficient, thanks to the explosion in social networking sites as well as the rise of Science 2.0 and open science models means that the research that you need can be found in blogs and wikis. More importantly, the rise of web 2.0 services means that more online communities exist, where members rate/recommend/like/comment on books, articles, links. 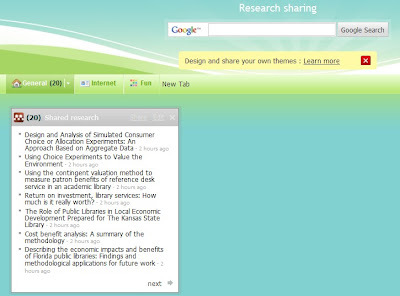 which gives the smart researcher an edge if he is able to leverage on such sources to spot ‘hot’ research. 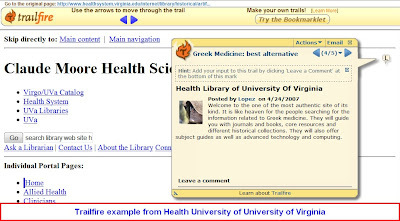 On the individual level, you can follow or watch research collegues or other researchers in the same area and see what they are reading. This trend has accumulated with the recent rush towards creating social networking and bookmarking sites for scientists and researchers (research 2.0?) . Examples include Labmeeting citeulike, Mendeley, Connotea, 2collab, ResearchGate, Nature Network, Zotero, Wizfolio etc. Some like Zotero and Wizfolio are evolutions of traditional bibliographic managers like Endnote and Refmanager. Others like 2collab and Nature Network are services from traditional Journal publishers like Elsevier. How can one keep track of all these diverse sources? Forunately, pretty much everything can be consumed via a RSS feed (or you can screen scrape (another list of services here) if you are desperate) and the smart thing to do is to put them all together into a RSS reader. I was just musing over the types of sources you would want to include, and I realized that there were several different possible sources, though you might not add all of them, some might be useful. 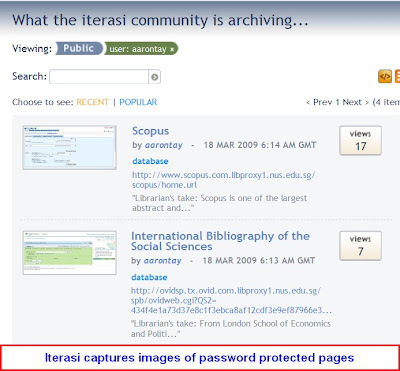 Academic databases like Scopus, Web of Science, Open source archives etc. Remember to use this trick to insert the ezproxy stem if needed. 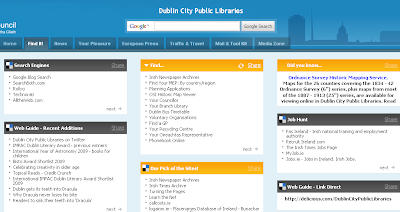 Many libraries now allow you to run searches in the catalogue and export the results as a RSS feed. Some maintain a “new additions” RSS feed by subject etc. Definitely add this to your stream to keep update with latest books published in your area. Many of the new generation OPACS, allows you to do tagging, and you or your research colleges could tag the books you are interested in and create a RSS feed for that to import into your stream. Still chances are most libraries don’t have an active enough community doing tagging on their catalogues to be worth tracking tags. However book sharing sites like LibraryThing, GoodReads, Weread, Shelfari might have a sufficient mass of users. 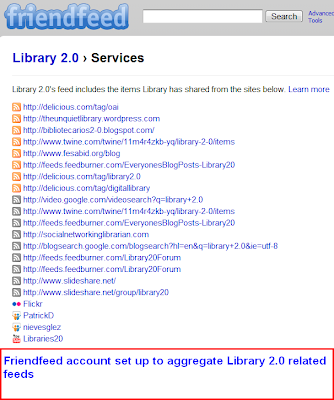 I know LibraryThing provides outputs in RSS, is it likely the rest do as well. You are not limited to your library of course. Try WorldCat (you can create rss feeds from user created lists, and new additions, might be possible for keyword searchs but requires a api key), or OpenLibrary or even Amazon (use built-in API or Yahoopipes)! How about Google books? Want to catch prepublication books? Maybe try one of the book vendors like Globalbooksinprint, Blackwell Book services etc, not quite sure if they offer RSS feeds though. This is somewhat rare, but if you happen to be fortunate enough to be in an area, where there are relevant blogs covering the area (For instance my old research area was on measuring information quality of Wikipedia, and there were 2 or 3 high quality blogs covering research in that area), you would definitely want to include that as a source. The paradigm example would be Delicious. As discussed in an earlier post, Lifestreaming aggregators allow users to pull all their activities from various web 2.0 services and or RSS feeds into one centralized area. The paradigm example here is Friendfeed where there is a thriving community of life scientists apparently. You find a guy who seems to be in your area posting on Delicious. But Delicious is not the sum total of all his activities. He might be doing stuff on twitter, posting documents on Slideshare etc. If he has a Friendfeed account, and he has thoughtfully added them all into his Friendfeed account you can get one aggregated feed to use into your stream! Social networking/bookmarking sites for academics. E.g Labmeeting, citeulike, Mendeley, Connotea, 2collab, ResearchGate, Nature Network, Zotero, Wizfolio etc (see list here and here). 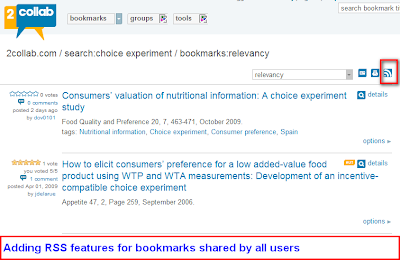 The problem with generic social bookmarking sites not designed for research is that most links shared are likely to be non-academic sources. But citeulike and their cousins are designed explictly for academic research, so it solves this problem. Most of them remind me of old school Citation managers like Endnote, Refmanager but adding social bookmarking and networking options. Zotero in particularly had zero social networking features until 2.0 (currently beta), and they just announced supporting of RSS feeds of public Zotero libraries. 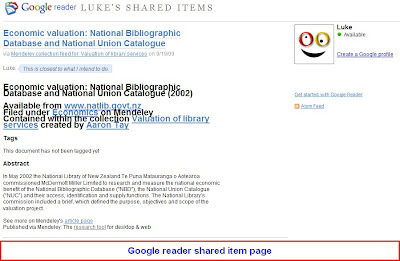 They not only allow you to keep track of citations but also incorporate web 2.0 sharing options. Keep track of what people in your research area are reading, or what are the most popular articles on an aggregate level. The same advise above applies on finding people to watch, tags to follow. 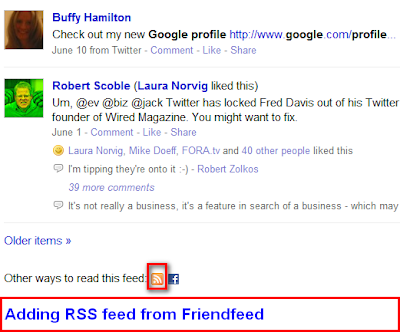 Obviously you should customize your rss feed to provide targeted and relevant results, and this is often possible (e.g. 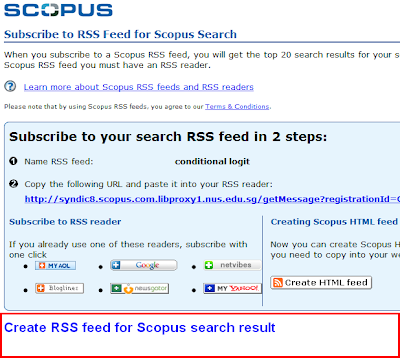 RSS generated from results from a powerful Boolean keyword search in Scopus) , but in many cases you can’t. If your RSS aggregator has powerful filtering options (or even recommendation systems), the problem can be lessened, but still you might consider filtering the rss feed first before pushing it into the stream. There are many options out there, Yahoo! pipes is the most powerful, but you can see some options in lists here , here. There seem to be 3 main classes of such services/software that you can use to aggregate all your sources but unfortunately none of them were designed for the academic researcher in mind, so there are some problems with using them to keep track of research. These are traditional rss feed readers. They tend to come in two forms, either web-based or program based. A sub class of these aggregators allow you to “build” your own newspaper from RSS feeds, essentially these are just RSS feed readers but with more innovative layouts that mimick newspapers (in pdf etc). In addition Firefox has several addons but Feedly (which works with Google reader accounts) is probably one of the best. There are many more RSS feed readers, see this long list compiled in 2007 and this list in 2009. Such services resemble their web-based cousins but allows you to embed not just rss feeds but widgets (e.g. search widgets) as well. They are typically much more flexible in terms of layouts and provide some minimal sharing features. Some libraries have used these services as sources for research on a general subject (also see my more detailed blog post), but it could obviously be used by an individual with a more specific focus. Friendfeed has already being mentioned. 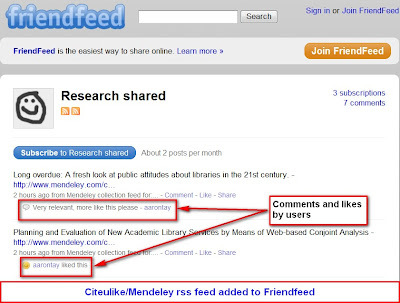 As Friendfeed allows you to add unlimited number of rss feeds as well as specific web 2.0 services into your stream it can be used to aggregate rss feeds you are reading as well. There are in fact some Friendfeed accounts created solely for that purpose. 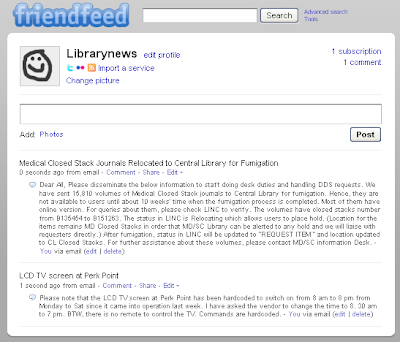 For example this is a Friendfeed account that aggregates Library 2.0 related feeds. A big plus about using Friendfeed to aggregate your sources is that it clearly has the most powerful search. 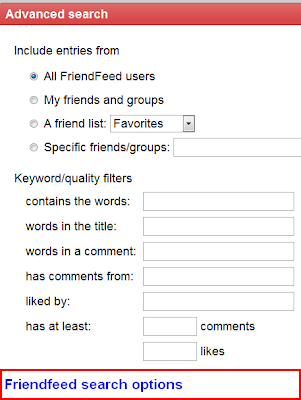 It was the first to allow other users to “like” (as well as comment) on entries and allows you to filter results based on how many “likes” or comments a particular entry has allowing you to spot hot topics. Friendfeed also allows you to be informed about updates (or update the stream) in myraid ways from email to instant messaging (or to be exported into RSS if you prefer). Another virtue of Friendfeed is that it implements “Real-time” push technologies if available (e.g for Twitter (details)), compared to just straight RSS which uses the slower polling technique. There is a ton of similar services around (e.g. http://www.plaxo.com/ etc) but few offer more features than Friendfeed , though I personally feel the layout of Friendfeed is inferior to say Streamy. If you are tired of Friendfeed type aggregators, have a look at Genwi or some of the “smarter” systems that try to learn what you like , e.g http://www.feeds2.com/ , though personally I’m not a big fan of automated learning/recommendation systems. So you have made your choice and you have all your sources aggregated nicely and formated in one place. But there’s a catch, as these tools weren’t designed in mind for academic research, you will find that there is no way to do citation/bibliographic management! Want to attach the pdf to an article or save the webpage? Too bad you can’t. Want to convert all your sources and cite them in APA style? No can do. The best you can do it seems is to use a class of services already mentioned – networking/bookmarking sites for academics. As these were designed from ground up for academic research, they also basically incorporated citation manager features of Endnote, Refmanager etc. They also have the advantage of being geared of allowing profiles to be tailored more academic research, compared to the more generic fields of other social networks. 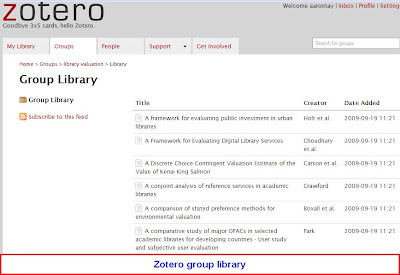 As they are designed for academic use, they have many powerful features like support for ezproxy, openurl, doi), provide useful analytics, and other little nice touches like allowing you to annotate pdf, full text pdf search (features from Zotero, Wizfolio, Mendeley etc. So why not use one of these services instead? I think this is where, they have missed the boat, they don’t offer RSS aggregation services! For now, the hybrid approach would seem to be best. Use one of the RSS feed aggregators above for discovery, then pull them into say Mendeley or Zotero in the usual manner. So what do you think? 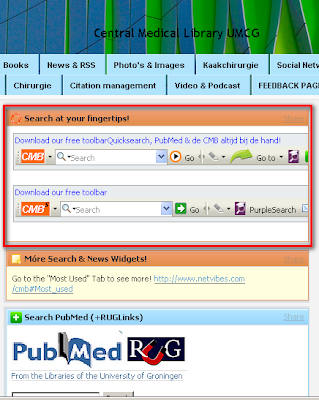 Are there social networking sites/services for researchers that help discovery the way I am using RSS feeds for? What types of rss feeds do you add for your research that I didn’t mention? Do Libraries met research 2.0? In the past few years, libraries have become increasingly innovative in the different ways they display their subject guide. Practically everything under the sun has being tried. What do such services do? They are dynamic personalized pages where you can choose to aggregate material from different sites. Typically you install widgets such as calenders, web-mail etc together with RSS feeds to put all your most commonly used material on one page. Of course there is nothing to stop libraries from creating pages made up of different widgets/modules and RSS feeds and opening access to the world. Such pages will function as normal pages for users who don’t use such services, while other users who do use such services can grab whatever modules/widgets they need to mix and match on their own pages. It’s unclear how many users use such services, so the question is why use this over static pages? Basically such services provide a lot of flexibility. 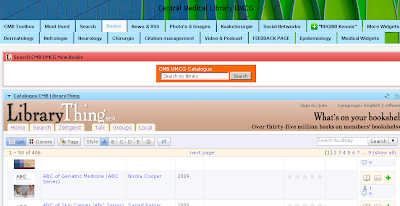 Staff can easily create tabs, arrange the layout of each section by drag and drop, grab different sections or pages etc. In comparison, wikis or static pages are harder to customize this way. 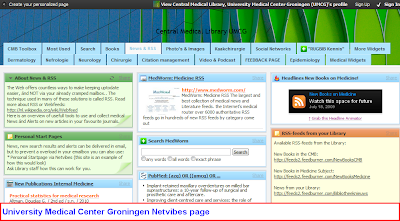 A good example is Central Medical Library, University Medical Center Groningen‘s Netvibes page. Looking at what libraries have done, you can see there is a lot of room for creativity out there, but let me describe some ideas I like. I basically looked at my own static subject guide and thought how I could convert it to something more dynamic. 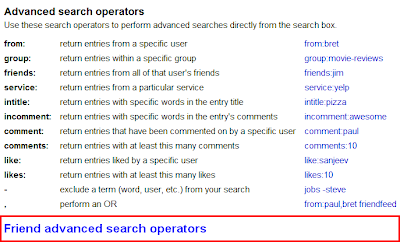 Let’s take it as given that the OPAC search box, FAQs, instructions etc are already available and focus on subject specific material. Examples will be drawn from Central Medical Library, University Medical Center Groningen , Shrewsbury and Telford Health Libraries , Dublin City Public Library . 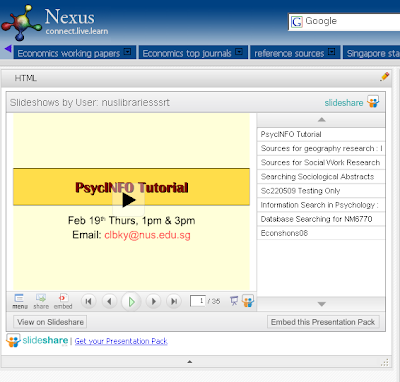 My own institution also offers Nexus, which is similar (will blog more about it in another post). Why offer lists of high impact journals when you can list table of contents of the latest issues of those journals? This is a pretty obvious idea, get the RSS feed of the table of contents of the latest issue of the top journals in a given field and then feed it into a widget/module to display the results. 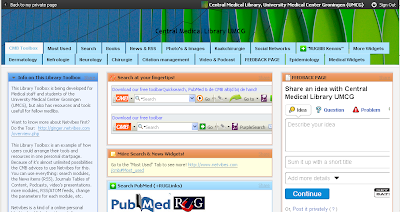 Most journals offer the RSS feed on their homepages or you can try ticToOCS Journal Service. To ensure that the link works to handle the ezproxy properly you should convert the RSS feed using the Yahoo pipes method I described previously. The most basic way would be to offer each RSS feed individually. But a more advanced idea would be to offer a widget that combines RSS feeds of several journals/search engines, filter out results that don’t meet a certain specified keyword , dedupe (and rank?) and display results. 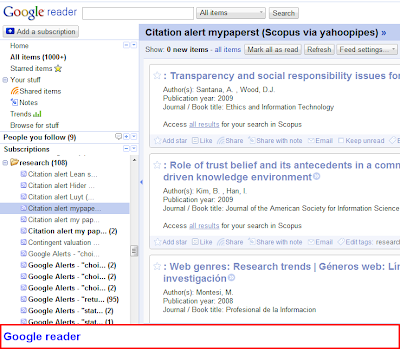 Or how about a widget/module that tracks citation alerts/mentions from Scopus/web of science and Google scholar, and dedupes results? I’m sure that will come in handy for people tracking citations of their papers. 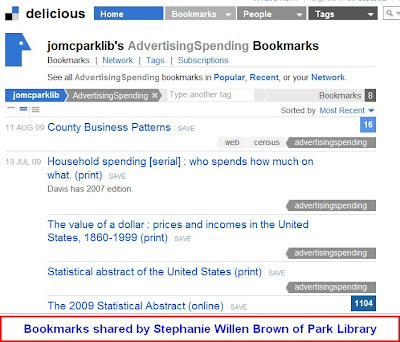 A widget linking to citeulike, various web-based citation managers? 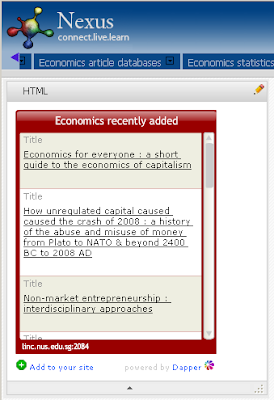 Why offer a boring static link to the recommended say Economics databases, when you can offer dynamic search widgets? Using the method I described here on now to Creating custom search boxes for library use , one can also offer search widgets to be placed on the startup page. 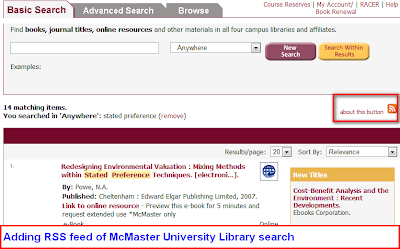 If you are a truly progresive library offering opensearch plugins, you can also provide a link to it too. As the image above shows, the user can grab the whole widget to put on their startup page (click on wrench icon), or they can click on “add search to browser” link next to the title to add the opensearch plugin version to their browser’s search box! 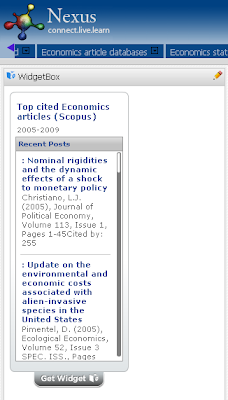 Use Scopus topcited to list top cited article in an area of interest. 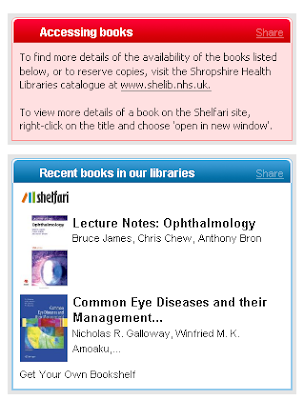 You can create a RSS feed from your OPAC showing a list of new books in a certain subject, or popular books. Or better yet embed a Librarything Widget! 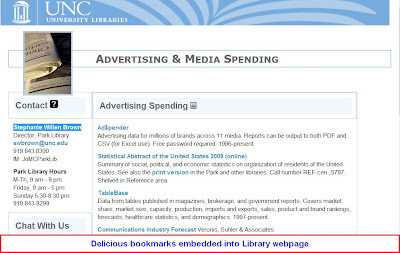 Your library uses Delicious to tag internet links? 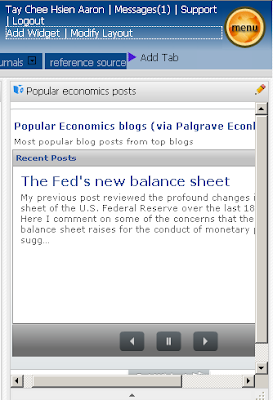 Insert a blog roll as a widget! If you have being linking to powerpoints of your subject specific tutorials, convert them into slideshare (or similar alternatives) and then put in the widget. It’s a bit clunky to have one slideshare widget for one presentation, so package them all in one using slideshare presentation pack to combine several in one (see below). Have screencasts of tutorials? Even better! My subject area is Economics so I can use palgrave’s Econolog which tracks and ranks most popular (based on comments) Economics blog posts. But what if you want to add blogs on other topics? What you should do is to combine the top 20 or so blogs in your area, aggregate and rank them using Postrank and grab only the top posts. 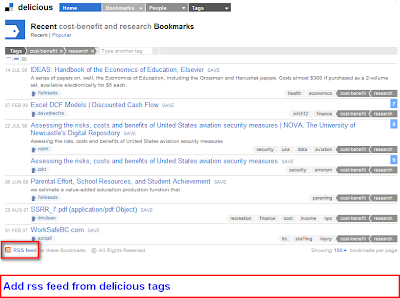 If you are not sure what the top blogs are in a given area, you can use delicious to search for most popular blogs (e.g. Geography+blog), grab and combine the posts from these feeds and then pass then through Postrank , a service which checks for duplicates and ranks or just displays top blog posts based on popularity (number of comments, number of clicks, number of blog trackbacks, links from social media sites like Twitter, Friendfeed, Digg, delicious, see details etc). How to : Build a Social media cheat sheet on any topic. 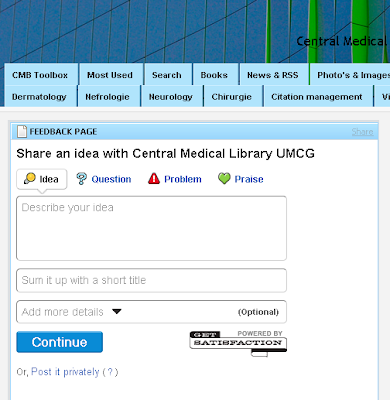 If you have created subject specific library widgets like conduit toolbars, bookmarklets etc , why not offer them here? 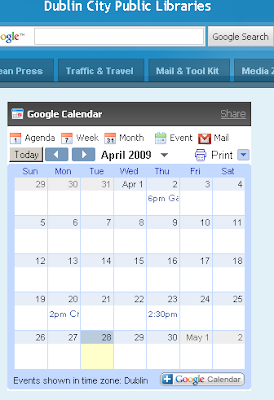 Use various calender 2.0 services like Google calender, 30boxes, upcoming etc to list events. E.g upcoming talks of interest (e.g. database talk, tutorials etc). Insert Meebo or your favourite chat widget so you can get feedback. Add a poll, or a askalibrarian form. If you are really bold, how about adding a twitter widget or even a getsatisfaction page/widget! Want to know how often your public Netvibes page is being accessed? Add a module with the google analyics code included! Of course, this works only for the public page, but typically each module/widget usage will be automatically tracked as well. I’m just scratching the surface of what can be done. In the future I will from time to time post about specific library widgets that have useful functionality.